The research in my lab seeks to improve our fundamental understanding of mosquitoes and their role in the transmission of pathogens responsible for human disease. Our team integrate traditional entomological procedures with molecular genetics and informatics-based technologies to deliver new insights into mosquito biology, ecology and behaviour and try to answers fundamental questions including what species transmit disease pathogens, where do they exist, why they are there and how do their populations connect and move. Exciting recent work include developing neat ways to use the male mosquito for population suppression and potential mosquito eradication. For a list of PubMed publications click here. We travel though an important time for vector biology, not only a critical area because of the current globally growth of vector-borne disease, but in terms of those predicted outcomes of population movement (humans and other organisms). Human urbanisation, a rapidly changing climete and Australia’s relationship with countries in our region means this transiting discipline is well placed to embrace and develop innovative approaches to some of our most pressing local, regional and global questions. 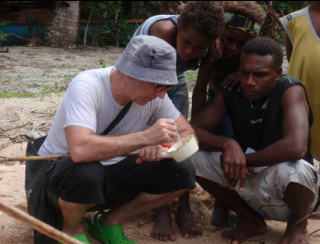 Our malaria vector research in the village of Haleta, Solomon Islands where we look closely at the behaviour, biology and ecology of malaria mosquitoes.